Don’t let them fool you. This vote is easier than you think. Have you ever felt like those in power don’t represent you? Or that your vote doesn’t make a difference anyway? You certainly aren’t alone. This fall, B.C. has one shot, one opportunity to ensure every vote counts. But you need to cast a ballot to make it happen. There is a group of old school politicians, lobbyists and political insiders who do not want our voting system to change. They are spending a lot of money and time to confuse and scare you. They tell us that the referendum is too complicated and we won’t understand it. Don’t let them fool you. Changing the entire political system so it actually reflects regular British Columbians is easier than you would think — you don’t even have to leave your house. First, check your voter registration. If you’re like me — under 30 years old and changed your address more times than you can count — you probably need to update your mailing address. If you move often or are a student, make sure your address is updated with Elections BC. Please note: after November 23 at midnight, you will no longer be able to request a ballot or update your voter registration. You will receive your ballot between October 22 and November 3. Mark it and pop it in the mailbox nearest you for a seamless democratic experience. It’s that easy. 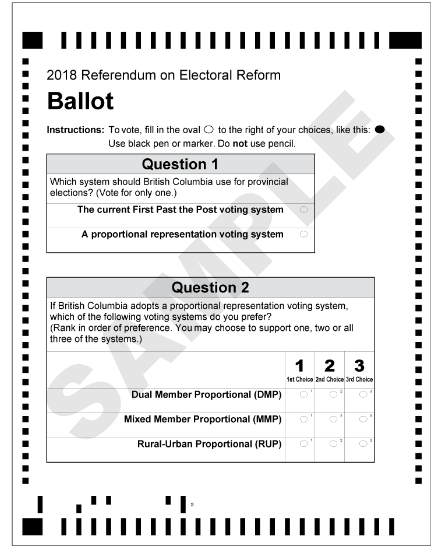 Elections BC must receive your ballot by December 7. Our current voting system is called First-past-the-post (FPTP). It’s kept elites in power since the 1950s. It’s helped keep young people and marginalized communities down. It elected Doug Ford, Donald Trump, Stephen Harper and Christy Clark, all with less than 50 per cent of the votes. With FPTP, less than half of the votes essentially equals 100 per cent of the power. That’s unfair. Proportional Representation (Pro Rep) is a real game changer. With Pro Rep, the percentage of votes will equal the percentage of power. So, 40 per cent of the votes (like Stephen Harper received) would equal 40 per cent of the seats in the House of Commons. Makes sense. It is also more likely to elect more women and minority groups while encouraging collaboration between parties. That means fairer representation for everyone. On your ballot, you can simply choose Pro Rep and leave the second question blank. You do not have to answer the second question. But if you’re feeling bold, you can also rank three different types of Pro Rep.
Don’t stress too much about this — all three options are better than our current system. Just choose the one you think will work best for you and your community. Dual Member Proportional (DMP), Mixed Member Proportional (MMP) and Rural-Urban Proportional (RUP) are your choices. Elections BC has a lot of great information on these systems, including videos explaining how each works. With DMP, most voting districts are combined with a neighbouring district and represented by two MLAs. The first seat in a district will go to the candidate with the most votes. The second seat goes to a party. Each party’s share of seats equals the amount of the popular vote they received. With MMP, there are two different types of MLAs — district and regional. District MLAs will be elected based on who gets the most votes, like our current system. The regional MLAs represent multiple districts and are allocated to parties within a given region, chosen from party lists. The district and regional MLAs add up to roughly match the party’s share of the popular vote. RUP combines two voting systems. Rural areas will use MMP (see above). Urban areas will use Single Transferable Vote (STV), with multiple MLAs elected in larger districts. Voters rank as many candidates as they like on their ballot. Districts have a minimum number of votes required to win one seat. When a candidate exceeds the quota, their extra votes are transferred to the voter’s next choice. Again, these seats roughly add up to a party’s share of the popular vote. The choice is yours. Remember: all three options are better than our current system. All of them. Don’t let others decide your future for you. Vote for Proportional Representation and make sure every British Columbian has a seat at the table. Best explanation I’ve seen yet! Very helpful and straight forward, especially knowing that I don’t have to make the second choice. Lets face it. Only a few countries like Canada, US and UK still use the outdated Past the Post system. Most of the world uses Proportional Representation or something similar and prefer it. Lets get with the times. A vote for PR is a vote for better democracy. FPTP is a pseudo-democracy at best. Conservatives only care about power, money and winning; they don’t care about democracy. Hi Don, That may be your experience based on who you’ve met, nevertheless many members of all political parties support fair voting organizations in Canada, including some federal Conservatives and provincial Liberals, and the B.C. provincial Conservative party (different from the federal party) supports Pro Rep. Pro Rep will be fairer to the three hundred thousand BC Liberal voters whose votes were wasted last year, and the three hundred thousand BC New Democrat voters whose votes were wasted, not to mention the almost three hundred thousand BC Green voters whose votes were wasted last year. Yes except that other jurisdictions give another option that chooses all the candidates in a riding by the voter not the politicians. Too bad the NDP did not give us that choice. That is the Rural Urban model, since STV in the urban areas allows voters to rank individual candidates. Creates more responsive candidates to the voters that elect them ,instead of to their parties. •Current voting (I dislike the perjorative and wish PR proponents would stop using it): When I vote, I have a direct say in the selection of the person who will represent me from my riding. If my preferred candidate is not the successful candidate, that does not mean my vote is “wasted;” it tells the successful candidate that diverse thinking exists to be taken into consideration. •Dual Member PR: Hideous with only one box for each pair of candidates. My say in the selection of the specific person who will represent me from my riding is only indirect unless I vote for an independent candidate. Except that an independent candidate can appear on the ballot on that person’s own, it is strictly vote-the-party, not vote-the-person. If I favour the independent, I end up with absolutely no say whatsoever in the selection of the secondary candidate. If I prefer the Primary Candidate of Party A, I’ll place my vote for Party A but I am stuck with the possibility that the Secondary Candidate, whom I utterly dislike, could also get in. I AM DENIED OPPORTUNITY TO VOTE FOR A DIFFERENT SECONDARY CANDIDATE. If I am really impressed by the Secondary Candidate of Party B, there is no way that I can give that person my vote without first electing the Primary Candidate of Party B even if I feel I cannot trust that person. •Rural-Urban PR: This gives two entirely different ways for our MLAs to get into the Legislature. The urban part would be similar to current voting except that the ballot would be an STV preferential ballot rather than a single choice ballot, definitely a superior way for us to express our choices (it is a myth that STV necessarily means larger ridings, each with more than one MLA; preferential voting will work just as well with single member ridings). The rural part is Mixed Member PR, see above. With PR the system will be more fractured and more comprises so nothing will get done but special interests groups will get more power and some radical parties could pop up and have a say.. .
lets look at successful companies…which one has many leaders all having to agree…NONE..
Best to have a leader who collects as much info as possible and makes a decision.. I strongly support ProRep BUT all 3 choices in the second ballot leave far too much power in the hands of parties to dictate their choice (in some cases the 2nd representative ). I prefer the Western Australia system …. check it out. Hi Doug! There are a lot of different Pro Rep systems out there, it’s true! However, right now parties have as much, or more, choice for their candidates as they would would under any of the three systems. Currently, depending on the party, members or leadership choose their candidates as well. Thank you for the article, good to know I don’t have to fill out the 2nd question. Frankly, I don’t understand the choices. Why would you vote for 2 candidates from the same party? who allocates the regional members with MMP? I’m just starting to learn about this so maybe some of the other resources will give me an answer, but thank you again for this information. Thank you for this information. Glad to know I don’t have to fill out the second question, I just don’t understand these choices. Just starting to explore this so maybe some of the other links will answer the questions. People when required to actually can collaborate and get things done. Here’s a few impressive things accomplished by minority governments in Canada. A few things accomplished by a minority government in Canada.